Recap: The awards are given out as the High School Tournaments end. Team Mizusawa is the resounding winner of the event, taking home the title and three individual championships. Back home, Chihaya has to go through surgery to help her ailing finger, using Arata’s masterful game against Shinobu as mental preparation for the path to come. Is she starting to see Arata in a way that goes past mere rivalry? 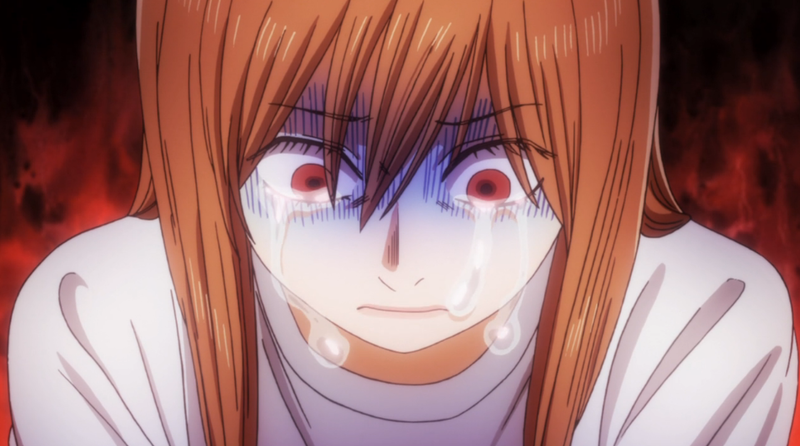 Man, you really just did that to me Chihayafuru? I have been waiting five weeks-FIVE WEEKS-for Komano to get his turn to shine in the Individual Tournament. Hell, even friggin’ Tsukuba got a little vignette about his run for the D-class championship and yet Komano gets nothing? Booooooooooooooooo. Alright, small incredibly biased problems aside, this was a great episode. Seeing Team Mizusawa reap the benefits of their hard work is always satisfying. 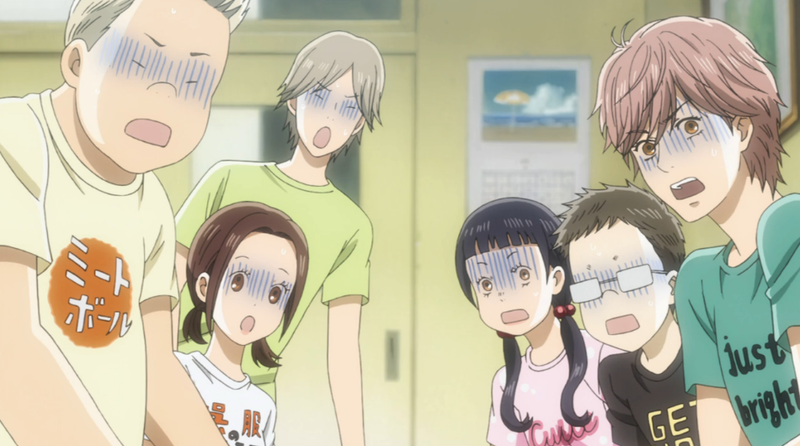 The fun and revelry quickly end as we finally get down to what’s wrong with Chihaya. Thankfully, it’s nothing career-threatening, but any time you hear about an athlete having to do surgery, it’s never good. The romance makes a return for this week, dominating most of the latter half. It seems like Chihaya’s old feelings are finally being brought back out. The thing that annoys me the most about Chihaya’s internal confession is how easily it can be twisted to continue to tease the romance. She said she loved him, but the show’s made it clear she just doesn’t think about that. In all honesty her idea of loving him might not even be romantic. At least Taichi seems like he’s finally going to man up and do something before this gets out of his reach. I love how Kana has always had a role in prodding Taichi forward in his pursuit, and it seems finally she’s gotten sick of him waiting. While it’s infinitely frustrating that they leave us off with such a tease about the romance, this was obviously the best point for a conclusion. With the ending of the high school tournaments, we had everything we needed to wrap up this section of their lives. It’s weird to think about how little ground was covered here as opposed to the first 25 episodes, but it’s understandable. By actually having Mizusawa compete well in the team tournament, it took a lot more time out than when they exited early. The show also took a lot more liberties in extending matches slightly more than they needed too, but it can be forgiven as they still were exciting. With a team tournament championship and 3 individual championships, there’s not as much of that desperate need to prove themselves like Taichi and Chihaya had back in the high school off-season. There are very few sports anime or manga I’ve been able to get into. 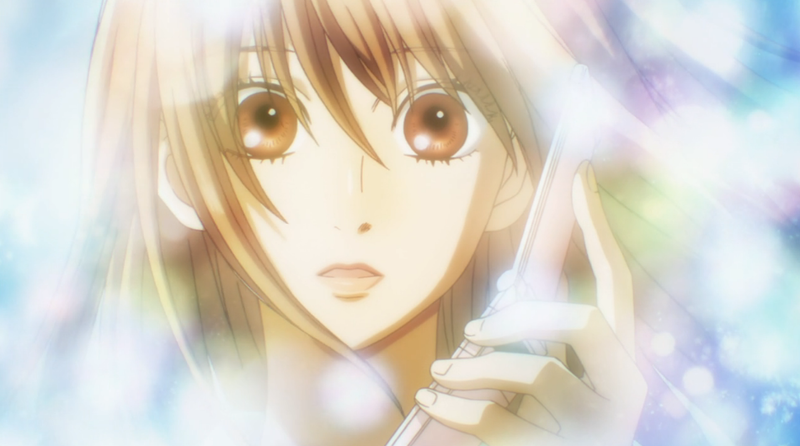 With Chihayafuru, it was karuta that really took me by surprise. I think it might just have been the strangeness of karuta that was initially turned me away when I first heard of this show in its original run, and boy did I make a mistake. What I found great was that I got to learn about a whole new aspect of Japanese culture. The competition itself was fantastic too. It did the same thing that made me love Eyeshield 21, my absolute favorite sports manga, it made our main characters beatable. 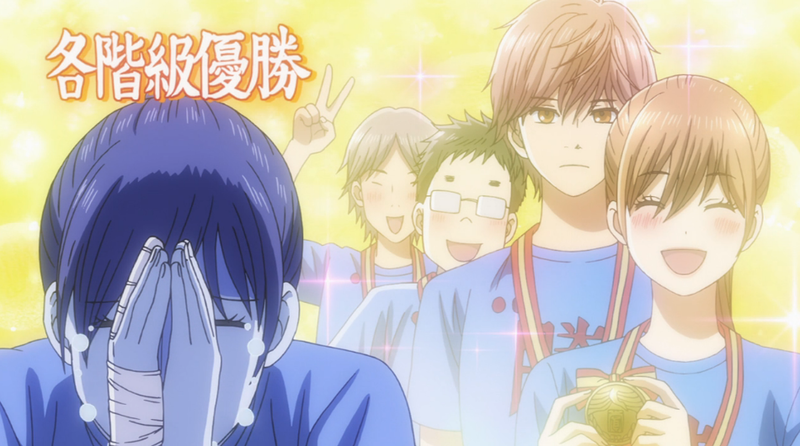 The greatest sports stories are those told through struggle, and watching Chihaya and her Team Mizusawa rise and fall was some absolutely gripping stuff. It helped that the team itself is one of the best ensemble casts I’ve seen in quite a while. This is the most essential thing when it comes to writing a good sports show, and Chihayafuru really manages to nail it. While Chihaya and Taichi are obvious the biggest focus characters, each member is so flushed out. They each have their own motivations and struggles in their experience with karuta that really compliments our leads. While I didn’t feel as much of a connection with the new freshman, they definitely grew on me as the weeks went on. With more time, I’m sure I’ll come to love them just the same. As is required with pretty much every Josei title, Chihayafuru has its romance, but thankfully they usually opt to keep it to the background. 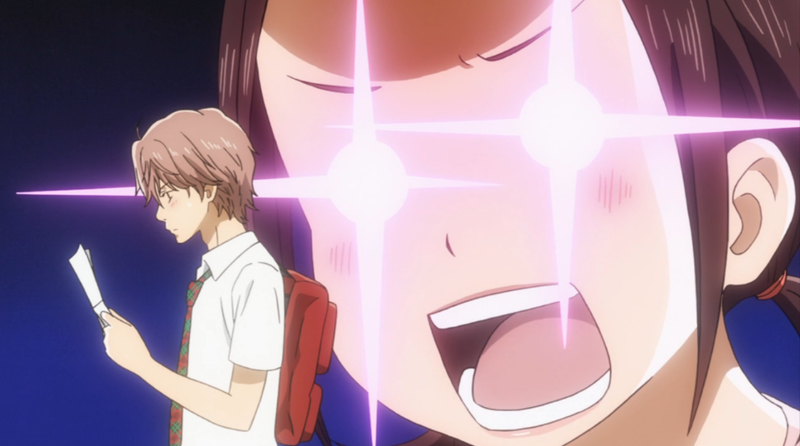 This is where I think Chihayafuru is weakest. This isn’t just speaking as a Taichi fan, although it certainly doesn’t help. The show wants you to buy that Taichi has trouble with confidence,that he can’t bring himself to really express how he feels to Chihaya. This is a man so popular with the ladies that he was able to get 20 girls to apply for the club on looks alone. In my experience dudes like that usually aren’t lacking on the confidence factor. It also just seemed strange to me how much Arata meant to Chihaya even after they had zero contact for several years. Sure, the same could be said of Taichi at the very beginning of the show, but he’s been with her ever since. Over the past two seasons this was far and away my favorite show to watch. I was pitched the idea to do it during the winter because, hey, I’m the shoujo/josei guy. That’s just what I do. I thought watching the whole 25 episode 1st season in the week before it came out would be taxing, but I quickly fell in love with it, and by the time I was done I was so glad I had more to count on for the next six months to come. Now that it’s over, I’ll have that tough decision to make between waiting for more to be made or continuing with the manga where this show lets off. For the moment, I think this show is best done in motion, and I will await more of it with bated breath.